1. Preheat oven to 350°F. 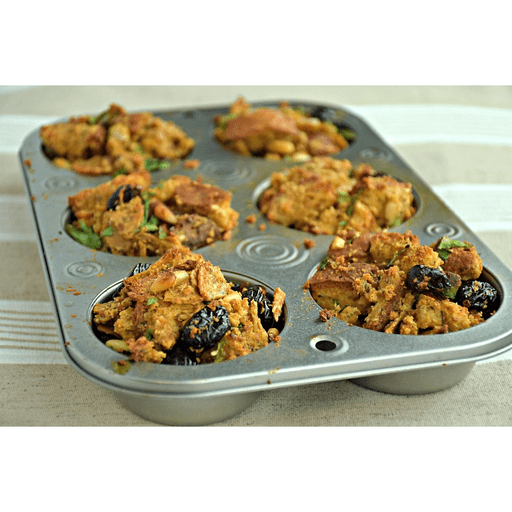 Prepare a muffin tin with cooking spray. 1. In a large bowl, gently toss bread pieces with oil, salt and pepper. Arrange on a baking sheet and bake until bread is golden, approximately 15 minutes. 1. In a large bowl, combine baked bread pieces with remaining ingredients and mix well to combine. 1. Transfer mixture into prepared muffin cups. Bake for 30 minutes or until golden and crunchy on top. Use vegetable broth in place of dry white wine. Calories 170, Total Fat 8g (Saturated 1.5g, Trans 0g), Cholesterol 40mg, Sodium 190mg, Total Carbohydrate 20g (Dietary Fiber 2g, Sugars 5g), Protein 4g, Vitamin A 6%, Vitamin C 6%, Calcium 4%, Iron 6% *Nutritional values are an approximation. Actual nutritional values may vary due to preparation techniques, variations related to suppliers, regional and seasonal differences, or rounding.